It’s hard to believe that Ken Loach has been working as a director for over fifty years now, starting off with television plays and eventually working his way into films, but the 80-year-old director is still as vibrant and as determined to examine the hardships of British life as he was when he first started out. 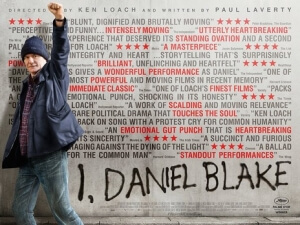 I, Daniel Blake, his latest such examination, proves this theory correct, as it is a poignant and often heart-breaking tale of poverty and the frustrating bureaucracy of the broken welfare system, and more importantly the honest people who are suffering because of it. The I of the title is, of course, a man named Daniel Blake (Dave Johns), whom we meet in the middle of a confusing and ultimately doomed assessment for employment benefits, after having a heart attack and being unable to resume work as a carpenter because of that. The frustration doesn’t stop there for the Newcastle-based Blake, as he must endure hours of automated calls and repetitive music as he tries to get in contact with them when the assessment comes back with negative results, and being told endlessly how he must sign on for Jobseeker’s Allowance online, despite him never being near a computer in his life. Things perk up slightly (the keyword being “slightly”) when he befriends Katie (Hayley Squires), a single mother forced to move with her two children to a tiny flat in Newcastle to escape a homeless shelter in London, and together they make small choices that ultimately alter their well-being, for better or for worse. Loach has always excelled at presenting harsh truths in front of us without compromising any of its bluntness for the sake of a happy ending – a prime example being that ending we all wish was different in Kes – and I, Daniel Blake is an indication about how this talent is still going strong. You really feel the confusion and anger that this kindly man is going through with this complex and unsympathetic system, especially if you have ever been on the phone at least once with these government outlets, and you find yourself wanting desperately to be in his shoes so you can tell them what you really think instead of silently accepting your fate. Anyone who has been in this situation will find themselves feeling accurately represented here, as Loach doesn’t shy away from how robotic it can all feel, with little to no compassion from their end, and more importantly the major effect it can have on anyone unfortunate enough to be caught in this situation. The naturalism of the actors, another Loach staple, really lends the film a genuine authenticity, making it feel more like a documentary than a scripted drama. The actors are individually very strong, and they share a sweet chemistry you can root for, but what stands out about them is their ability to ground their performances and not go too dramatic in a typical actor sense. There are no real “Oscar moments” here, and when there is a sudden outburst of emotion it’s kept very realistic and downplayed, like how a real human being would act, instead of destroying stuff in a typical scene of frustration. Getting the actors to share a familiar and even uncomfortable sense of naturalism in their performances has always been one of Loach’s strengths, harkening all the way back to his 1966 television play Cathy Come Home which, though controversial at the time, was memorable not just because of its then-taboo subjects of homelessness and unemployment, but because the actors gave such realistic performances that people for a while actually thought the lead actress, Carol White, was actually in the situation her character was in. That hasn’t changed with the quietly powerful and unnervingly real performances that Loach has gotten out of his actors fifty years on. Though not an entirely happy film, as a film about modern poverty and complex welfare systems shouldn’t be, there are moments of hope that are scattered throughout, giving the audience some light relief amidst the disturbing harshness of reality this film eerily mirrors. There are some funny moments that come as sweet relief, as well as some sweet ones that make you feel for the characters that have unwittingly found themselves in a rough place. They are glimmers of sunshine in a film drenched in heartbreak and social tragedy, and if I, Daniel Blake doesn’t at least fill you with the same type of emotional frustration that its title character is going through, then the film hasn’t achieved its ultimate purpose. I, Daniel Blake is a powerfully moving examination of the broken welfare system in modern Britain, which director Ken Loach keeps afloat with all-too-familiar scenarios and stunning naturalism from the actors.